Hola!! Sending you a little Italian all the way from Mexico! Hoping everyone had an amazing 4th of July! My family and I are still in Mexico and today we are celebrating my oldest brother Creighton’s birthday. I’ll be home tomorrow night, but until then I’m enjoying the Mexican salty air and sunshine! Oddly, today I am sharing a bit more of an Italian recipe with you guys, but don’t worry as soon as I get back I’m going to be recreating some of the amazing Mexican meals we have had here! 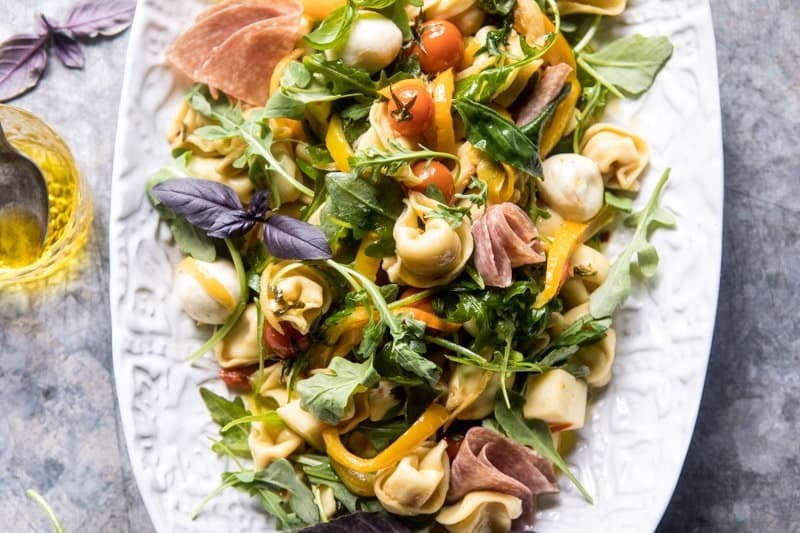 In the meantime, it’s Tortellini Pasta Salad, which you may or may not know that I love! 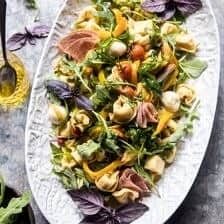 I made this salad last week after it was requested by the family that I make a tortellini pasta salad. 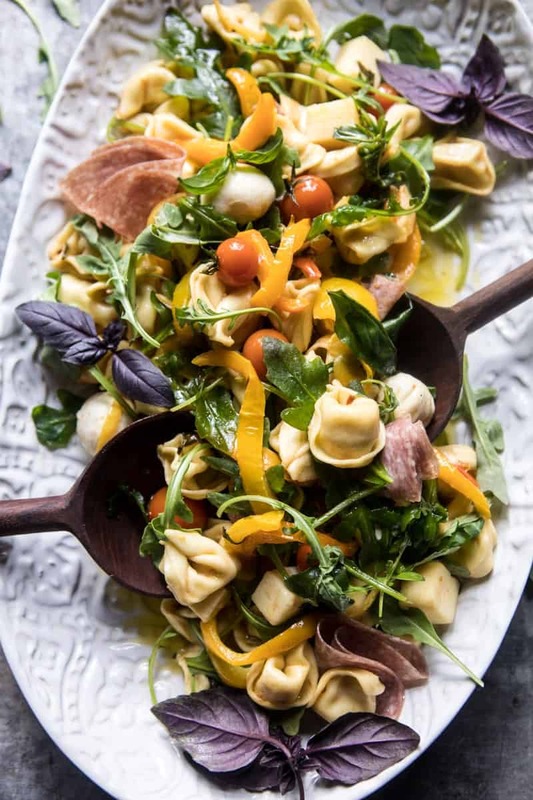 And by family I really mean Lyndsie, who said I absolutely NEEDED a tortellini pasta salad on the blog. 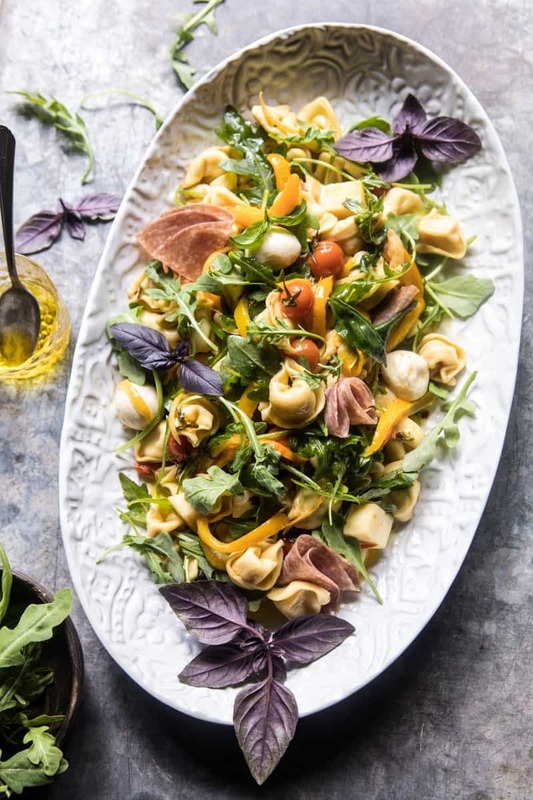 Not going to lie, I was a little hesitant at first, only because I feel like a tortellini pasta salad is nothing new, but I’m so very excited with this recipe and how it turned out. I actually think it’s the best pasta salad I’ve made to date. The secret is all in the olive oil. Instead of a traditional vinaigrette I made a herbed oil by using garlic, slow cooked bell peppers, cherry tomatoes, and herbs. 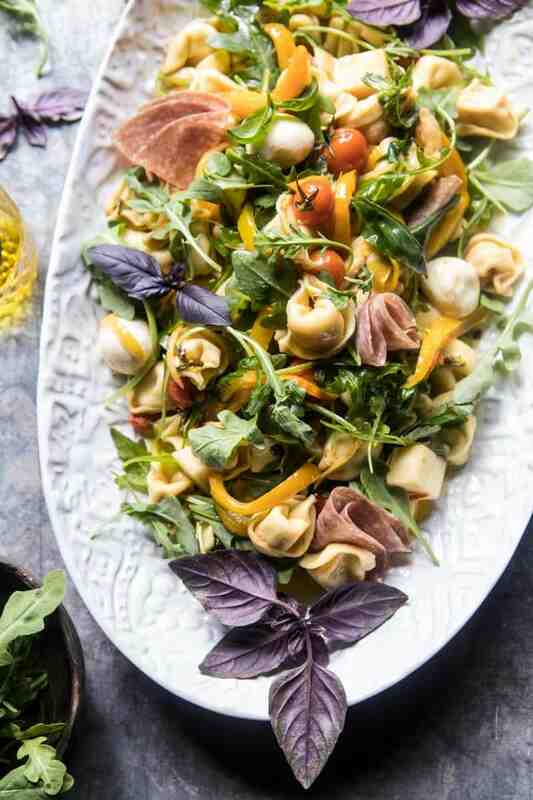 Then just pour the warm oil over the tortellini and toss everything together with fresh mozzarella, provolone, arugula, tons of fresh basil, and a drizzle of red wine vinegar. This recipe is perfect for making a few days ahead and letting sit in the fridge. I swear the longer it sits the more flavor it develops. It also uses up some awesome summer produce in the form of bell peppers, tomatoes, arugula, and fresh garden herbs. And I love that not only is this made with cheese tortellini (or spinach), but that it also uses fresh mozzarella and provolone. You know me…cheese!!! OkOK, and with that I am out for the day! Spending my last day in Mexico with my family, having fun and finally taking a break from work. 1. Heat a medium skillet over medium heat. Add the olive oil, bell peppers, tomatoes, garlic, oregano, lemon zest, and a pinch of both crushed red pepper and salt. Cook until the tomatoes just begin to burst and the garlic is fragrant, about 15-20 minutes. Remove from the heat and let cool slightly. 2. Meanwhile, bring a large pot of salted water to a boil and cook the tortellini according to package directions until al dente. 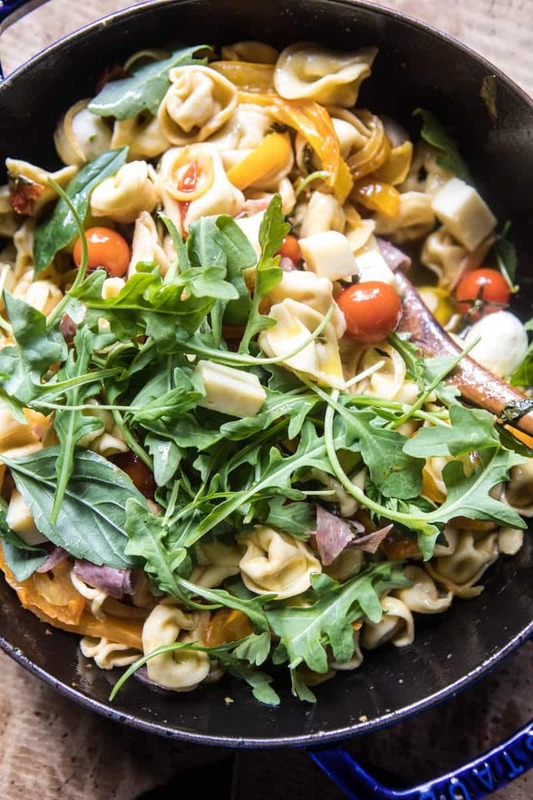 Drain and then add the tortellini to a large salad bowl. 3. 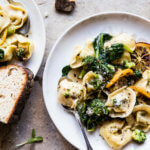 Pour the olive oil over the tortellini. Add the red wine vinegar and mustard and toss to combine. Add the arugula, basil, provolone, mozzarella, and salami and toss. 4. Serve the salad warm or cold. It will keep in the fridge for up to 5 days. Have a great Wednesday everyone, and maybe enjoy some pasta for dinner!!! YUM!!! 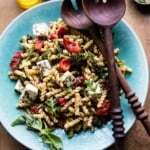 Fabulous pasta salad recipe. Keep having fun in Mexico! Thank you Liz! It was a blast! Love this Tieghan! It sounds amazing and simple. I’m a big fan of food that can sit in the fridge for a few days and only get better! Hope you’re having an amazing vacation! Yes me too! Thanks so much Debs, Mexico was so so much fun! I love all the colours!! This dish is so beautiful – almost too good to eat….almost! yes, please, I’ll be happy with this all right! So glad you’re liking it! Thanks Ruth! Amazing salad…..perfect for my Dinner for 8 party next week…Thank you! Please share where to find the georgious platter you are serving it on…! That is from Crate and Barrel. Link Below! 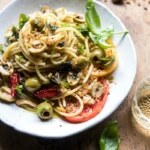 I love addition of salami to this pasta. All these flavors sound amazing. I also love how you served this amazing dish. Thanks for sharing. Hope you’ve been having a great trip! 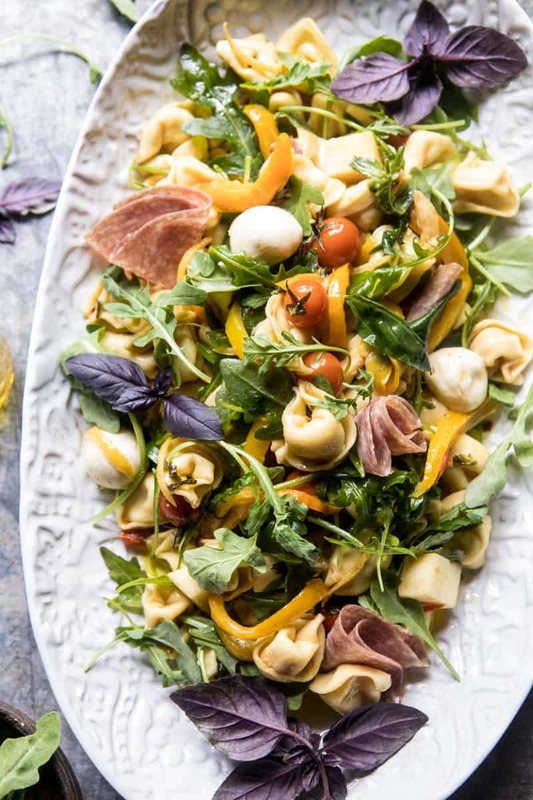 This is the perfect summery Italian salad! My trip was amazing! Thanks so much Laura!! That is so great! Thanks Brenda! Thank you! I hope you love this and it turns out great! Such a colorful salad! I love the flavors you used. Perfect for a summer gathering. Hope you had fun in Mexico. I had a blast!! Thank you Alice! i love this traditional italian salad. Thanks for sharing it. I would try it out this weekend. Happy Weekend. I hope you love it! Thank you Laura! Absolutely delicious and beautiful! Will be making this recipe again and again. 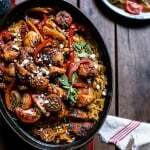 Question-your photography is so beautiful, is it possible to print a photo of the finished dish along with the recipes? Thank you so much! Of you can print a photo! There should be a photo in the recipe itself too! 🙂 Let me know if you have questions!